The original name of Swami Vivekananda (1863 – 1902) was Narendranath Dutta. Hewas the chief disciple of the Ramakrishna Paramahansa and the founder of the Ramakrishna Math and the Ramakrishna Mission. 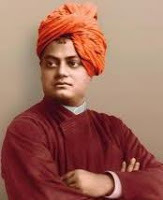 He introduced of Hindu philosophies of Vedanta and Yoga to the "Western" World, mainly in America and Europe and is also credited in bringing Hinduism to the status of a major world religion during the end of the 19th century. He is considered to be a major force in the revival of Hinduism in modern India. He is best known for his inspiring speech beginning with "Sisters and Brothers of America",through which he introduced Hinduism at the Parliament of the World's Religions at Chicago in 1893. After studying Advaita Vedanta (non-dualism, all religions are true, and service to man is the most effective worship of God) from his guru, Ramakrishna Paramahamsa , he became a wandering monk, touring the Indian subcontinent and getting first-hand knowledge of India's condition. He later sailed to Chicago and represented India as a delegate in the 1893 Parliament of World Religions. But to his disappointment he learnt that no one without credentials from a bona fide organization would be accepted as a delegate. He came in contact with Professor John Henry Wright of Harvard University.After inviting him to speak at Harvard and on learning from him not having credentials to speak at the Parliament, Wright is quoted as having said, "To ask for your credentials is like asking the sun to state its right to shine in the heavens." Wright then addressed a letter to the Chairman in charge of delegates writing, "Here is a man who is more learned than all of our learned professors put together." He attracted widespread attention in the press, which dubbed him as the "Cyclonic monk from India". He conducted hundreds of public and private lectures and classes, disseminating Vedanta and Yoga in America, England and a few other countries in Europe. He also established the Vedanta societies in America and England. The name Vivekananda was suggested by the Maharaja of Khetri. In 1897 at Belur in Calcutta, Vivekananda founded the Ramakrishna Mission—the organ for social service. The ideals of the Ramakrishna Mission are based on Karma Yoga. Its governing body consists of the trustees of the Ramakrishna Math- the organ to carry out religious work.